On a cold morning in March, musicians begin setting up in the cafeteria/gym at Wood-Gormley Elementary School in Santa Fe. Soon youngsters file in, waving and looking with awe at the artists and their instruments. Students and teachers are clearly eager for this final concert of the year, part of Music in Our Schools—the Santa Fe Chamber Music Festival’s largest educational program. Once everyone is settled in, Master of Ceremonies Angela Gabriel talks to the children about topics that range from Baroque to jazz, telling the story about J.S. Bach once walking more than 200 miles to hear his friend Dietrich Buxtehude play the organ and how to hear the differences between classical music and jazz. At the end of the concert, curious children crowd around Horace and John to ask questions and get a closer look at the instruments; on their way back to the classroom everyone thanks the performers for their music; it is a bright and beautiful spot in the middle of a school day in Santa Fe. 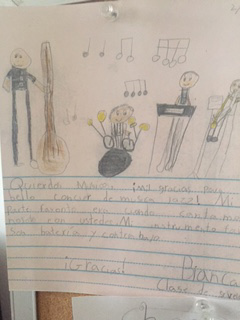 The Music in Our Schools program serves 10 Santa Fe public schools—plus Pecos Elementary and Santa Clara Pueblo Day School. It requires extensive planning throughout the year, and the week of each concert is the culmination of many months of planning and preparation. After the repertoire is chosen, experienced teachers write curriculum and prepare lessons based on the most meaningful aspects of this repertoire. The process includes analyzing the music, applying common principles and methodologies of music education, and experimenting with new techniques to make such advanced concepts accessible and kid-friendly. These materials and lesson plans are prepared for all 35 Music in Our Schools teachers at workshops held up to two months before the week of concerts. Teachers deliver these lessons to all children at their schools, so that by the time the artists arrive students have spent several class periods learning the key concepts that will be highlighted further during the performances. This active learning in the classroom prior to the concerts is an aspect of Music in Our Schools that makes the program unique. 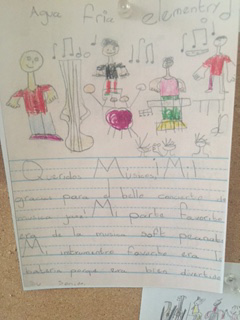 Best of all, by enjoying music and musicians, children learn that all types of music can enrich and delight their lives.